Black Stanchion Sign Frame is two sided and features an easy top insert with clear acrylic protective lenses to display your sign. Sign options include Landscape or Portrait orientation. They are available in sizes 7 X 11 in., 8.5 X 11 in., and 11 X 14 in. 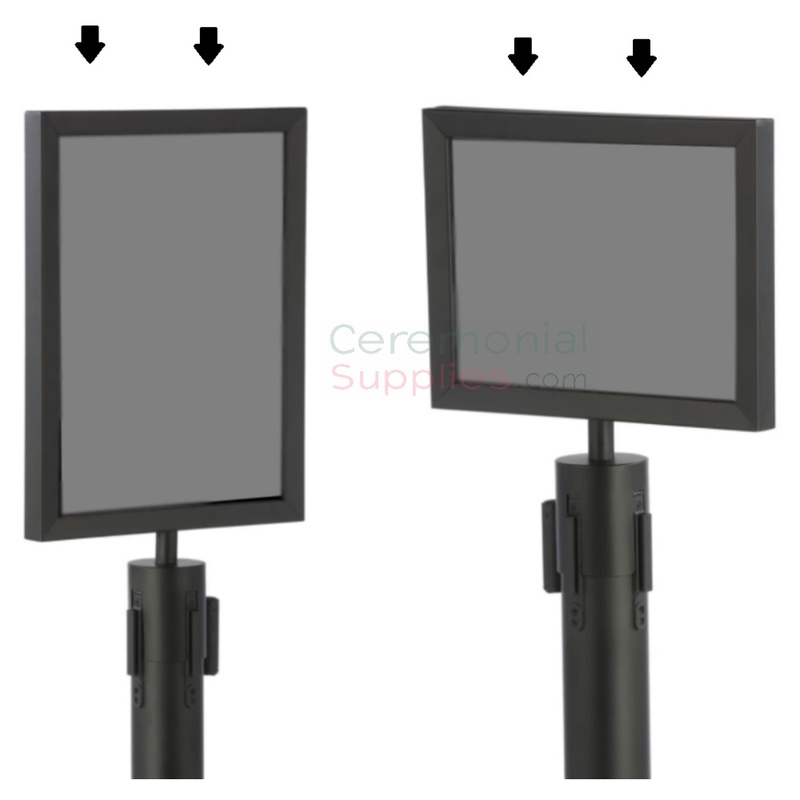 They are made of Solid Steel with a Matte Black Finish to match with our black retractable stanchions. Attachment cup has 4 slots that easily lock into our 4-way stanchion adapter top. Simply mount frame on top of our 4-Way stanchions and insert your sign of choice matching the selected dimensions. This Black Stanchion Sign frame features clear acrylic protective lenses and an easy top insert to display your sign in either landscape or portrait orientation. Framed with solid steel in a matte black finish, this is perfect to mount on top of our matching black retractable stanchion posts. The sign frame’s attachment cup has 4 slots that easily lock into our 4-way stanchion adapter top. This steel black Stanchion Sign Frame provides guidance and direction to all your event attendees while offering the same luxurious style that coordinates with the rest of the function’s decor.